Smile! You were born! And, we're so happy that you were! 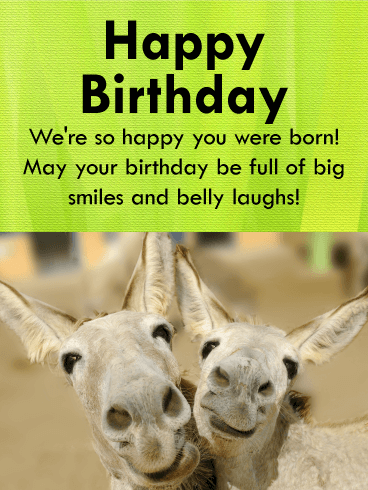 These smiling donkeys have a fun birthday message to share. 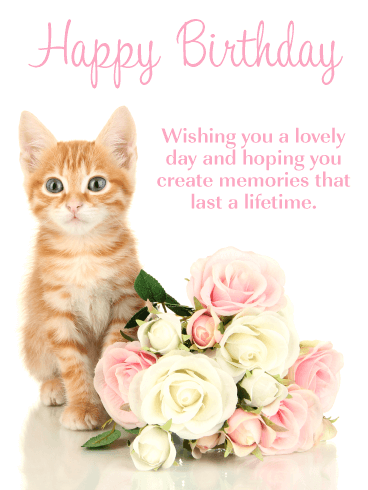 Send someone special this cheery birthday greeting card today. Wish them a great birthday of smiles and laughs. 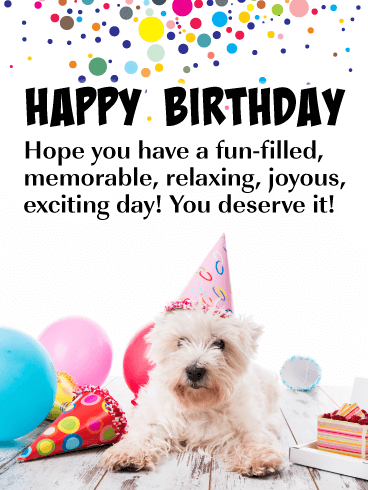 Let the fun begin when you send along this happy birthday card! Not just one adorable donkey, but two! What could be better? It's gonna be a great birthday! 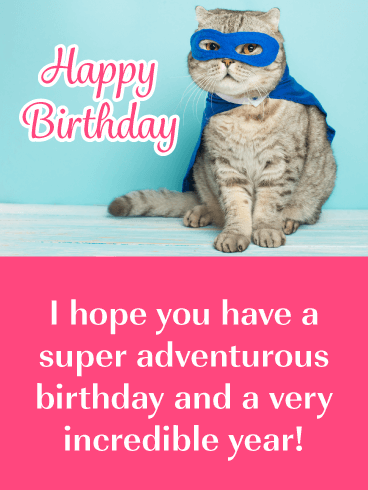 Your birthday friend will squeal with delight at this birthday card! Puppies bring a smile to everyone's face and these four will melt even the hardest of hearts. Curled up together and waiting for love, these puppies are eager to play and shower lots of love on the birthday person. 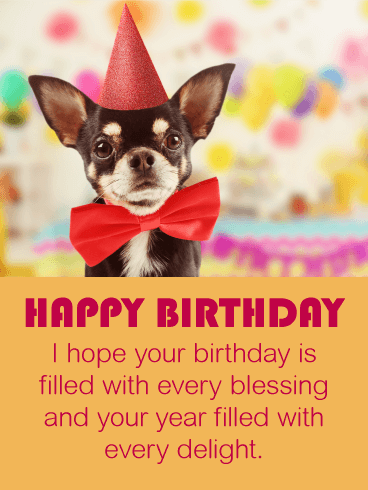 Fun and happiness fill this dog birthday card, so send it to them now! 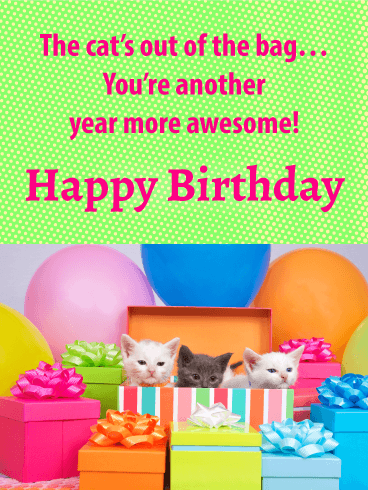 The cat’s out of the bag…they’re another year older and more awesome! 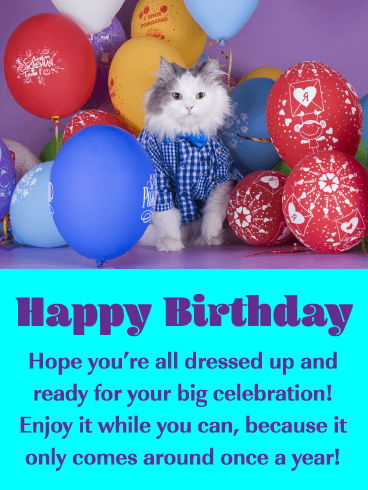 Let them know with this happy birthday card, featuring a cute trio of kitties inside a bright striped gift box, surrounded by more colorful presents and balloons, which add to the fun and festive spirit. It’s such a great way to tell them how special they are, with a little help from some adorable, furry friends! 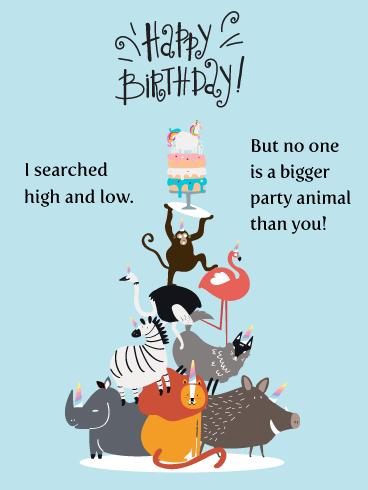 This fun birthday card will capture the heart of anyone celebrating their big day! 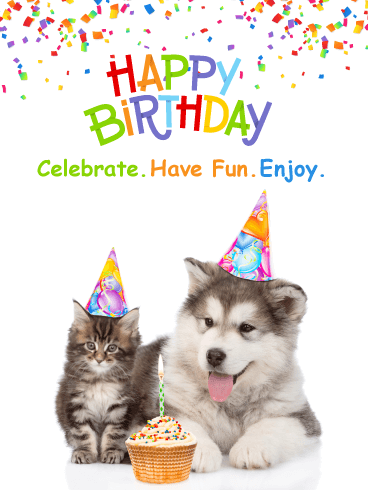 It features the most adorable kitten and puppy wearing birthday hats. They are ready to enjoy their birthday cupcake and have some fun! This greeting card also contains colorful confetti and creative Happy Birthday lettering. It’s perfect! Send these two on their way to meet someone special today! No one can resist a sweet kitten, especially when she is resting near beautiful flowers. This birthday card was designed to add joy to someone’s heart as they celebrate the day they were born. So be sure to send this little kitten on her way to wish someone you know a lovely day. They will be so glad you did! 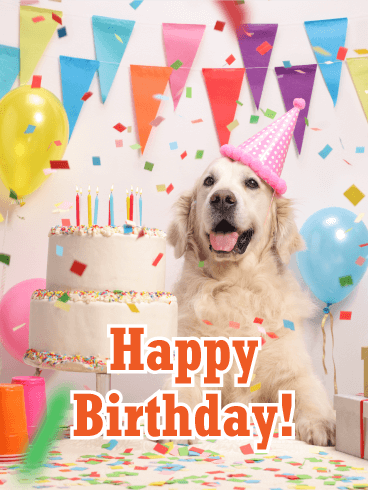 This adorable pup is here to help you wish someone a very happy birthday! Wearing a festive red bow tie, and blowing a party horn, he’ll make sure they make the most of this special occasion. 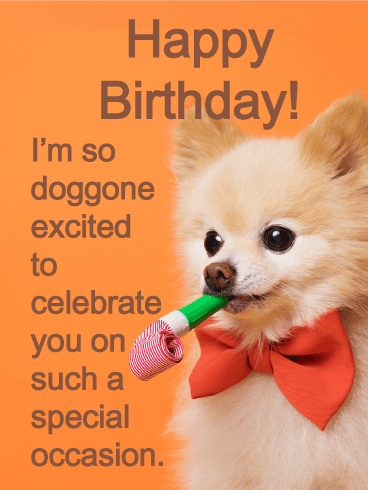 With a bright orange background for an extra fun touch, and your words that let them know how doggone excited you are to celebrate them, it’s the kind of greeting they’ll always remember. Know a cutie that brightens the mood wherever they go? 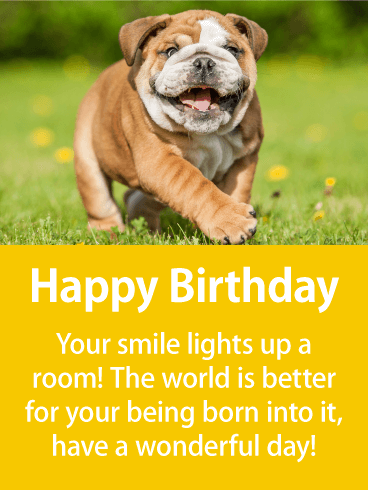 Let them know you've noticed their glow by sending them this adorable happy birthday card with a smiling puppy gallivanting through a sunny field for their special day! The message on the card lets them know you are so happy they were born, which is sure to bring joy to the recipient. Woof! Ruff! Arf! 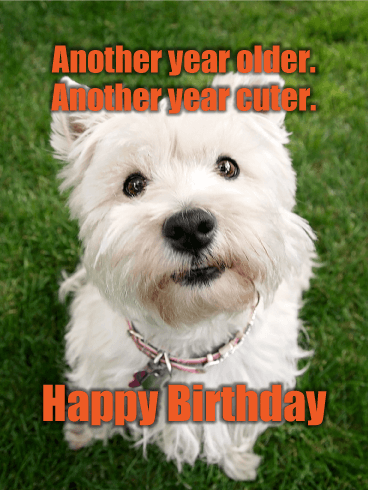 And Happy Barkday! Your pal simply will not be able to resist returning the big ol' smile when they see this dog's goofy grin! 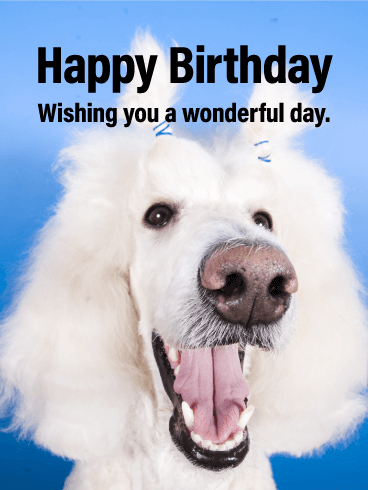 Wish them a wonderful happy birthday by choosing to send this smiling white dog on a brilliant blue background! 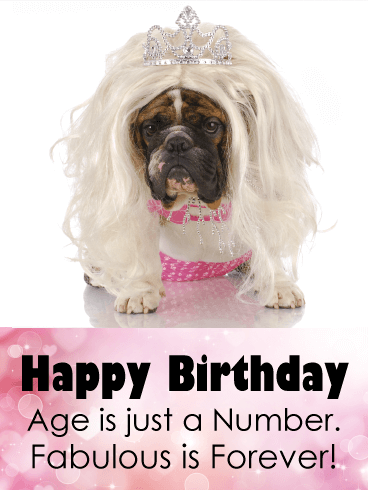 Great birthday card for dog/animal lovers or simply just anyone who loves to laugh! Polka-dotted party hats and burgundy bow ties. 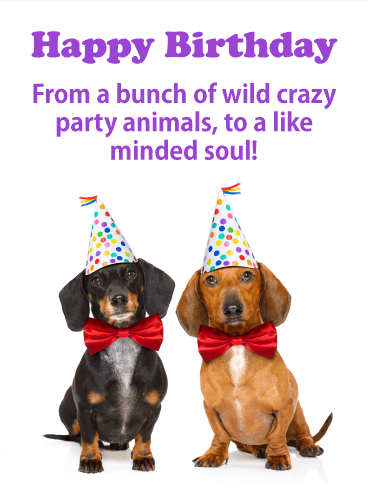 These Party animals wish a happy birthday with love in their eyes! 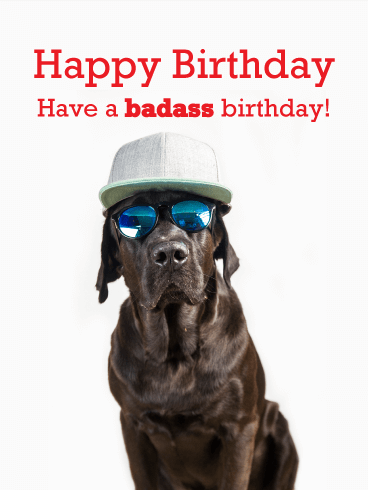 Send your friend who loves dogs as much as a good time, this birthday card to put a grin on their chin! Nothing brings cheer like having a couple of cuties say Happy Birthday! They are sure to give it canine out of 10! 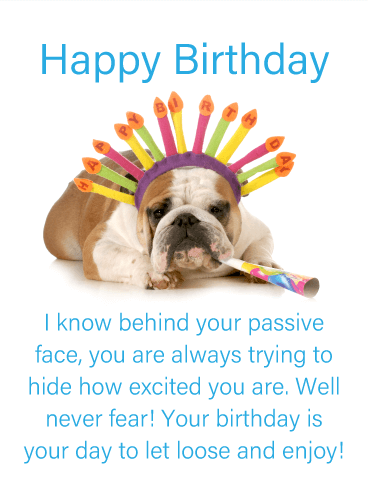 We dare you to look at this birthday card without grinning from ear to ear. It's simply not possible! The picture in itself is adorable and catches the eye right away. 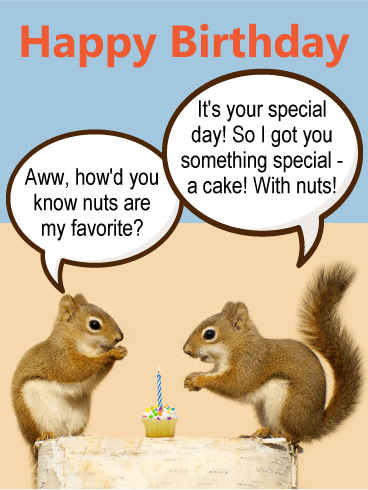 Throw in the pun about nuts and you have a winning birthday card. 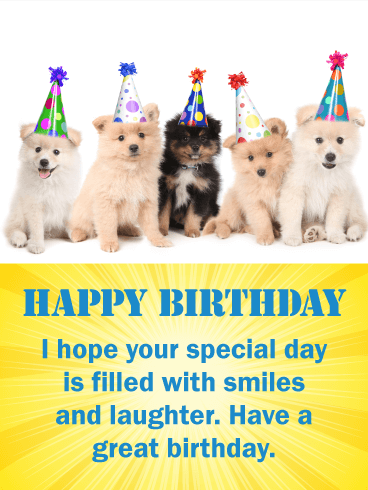 This is a great choice for anyone in your life celebrating a birthday and is sure to bring a smile to their face. A good rule of thumb to follow is that you can never go wrong with a card with a puppy on it. After all, how adorable is that?! 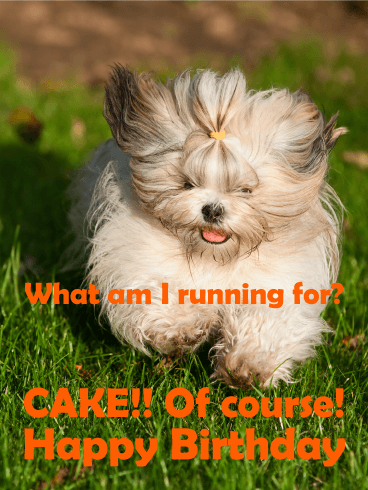 The picture of the pup is enough to make anyone say, "Aww", but the joke about running for cake is what really sets it over the top. 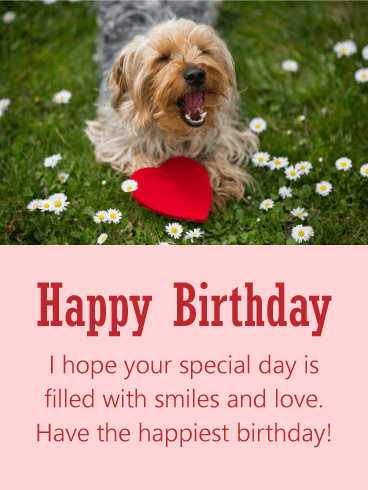 This birthday card is perfect for the dog lover in your life! 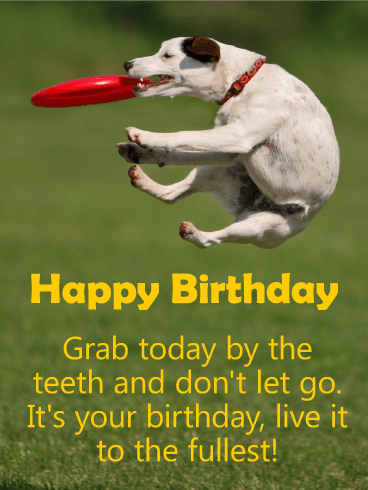 Make sure this birthday is filled with the best things! All birthdays are best celebrated with things that make us smile, like parties and dogs and little hats. But most importantly, by the feelings of love and joy that come from being valued. 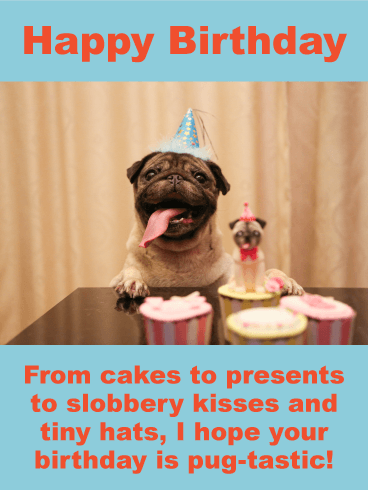 Send this Pug-Tastic birthday card to someone special to let them know how much you care about them. It's sure to make their day. If you finish a birthday exhausted, you know you had a great time. This old dog has hit his limit, but he's still putting in the effort for a party. Whether a birthday is low-key or a rowdy party, the person of honor knows what really makes it special is time with friends and family. 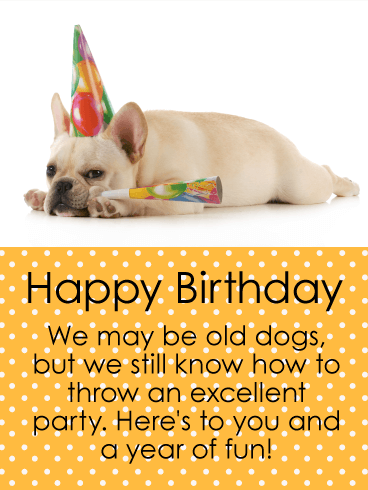 So dress up your affections with a party hat and send this celebratory birthday card. Near or far, we always remember our friends. And when the familiar day of their birthday rolls around, our ears perk up and we start nosing around for the best gift to get. 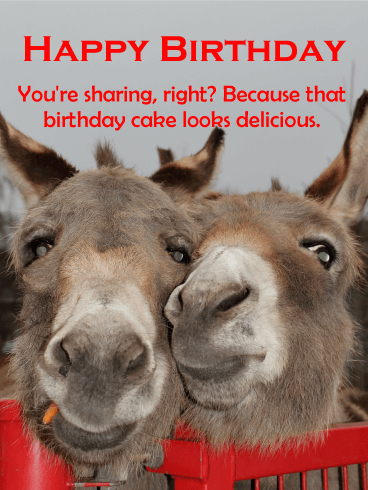 This year, send your friend a fabulous card featuring these rural donkeys. Fuzzy, warm, enduring, and yes stubborn they embody the friendships that last for years. You can't find a better "Happy Birthday" messenger. From smiles to pieces of cake, birthdays are filled with wonderful things to share. Share everything you can with the birthday boy or girl this year - remembrances of memories, bags of candy, a dozen selfies, birthday treats, your feelings of friendship, and dozens of hugs. 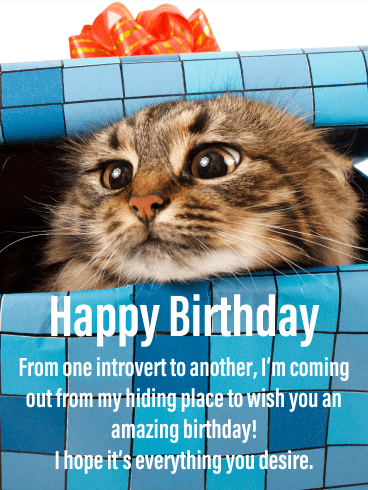 So send this cuddle card and announce "happy birthday!" to the person you share everything with. The longer you know someone, the more to you them, the more you can predict their moves. And while it may be scary how well that works, it does make you a genius in giving birthday gifts. 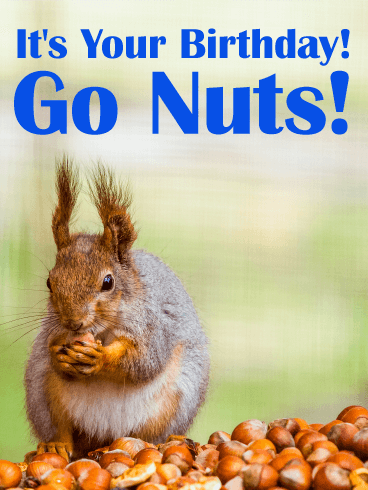 Do you know what you should send this year? 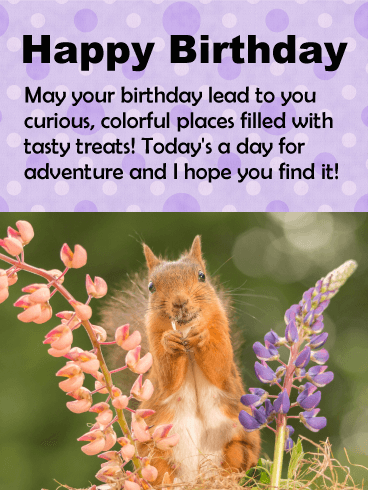 We bet you do, and it's this adorable birthday card feature the best chipmunk buddies in the world. The wonderful thing about gardens is that each time you walk through them you discover something new. Different flowers blooming, new birds signing, and curious critters coming to say hello. Birthdays are no different, each on celebrated in new ways layered on new experiences. 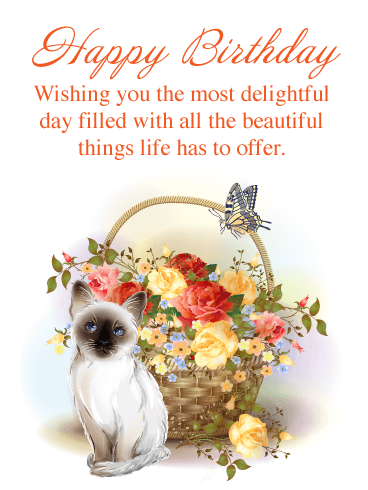 Add to the joy of a birthday this year by sending this beautiful garden card! 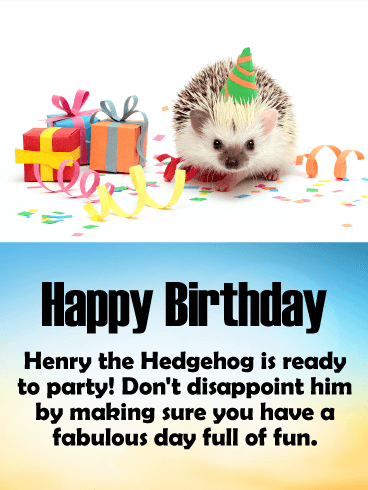 This little hedgehog and cute and adorable, just like the person receiving this birthday card! A single birthday is small, one day a year, but they can be the best day in the entire year if done right. 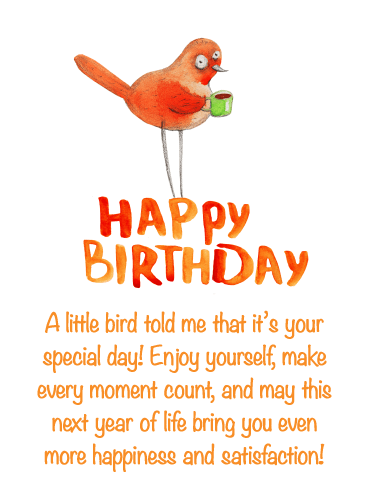 And part making sure the day goes well is sending a fabulous birthday card! So pack up this small partier and his gifts and send him to someone special and deserving of the best birthday ever. 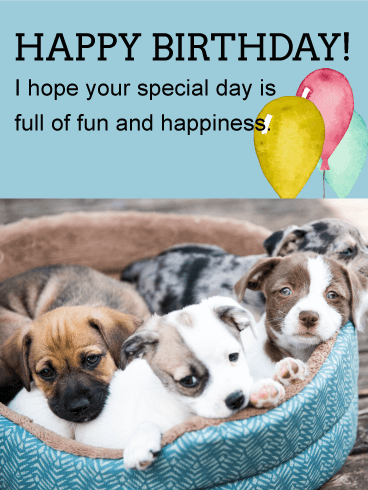 Catapult yourself into best friend territory with this pooch-filled birthday card! Encourage the birthday boy to jump high and revel in his day. To catch every good thing sent his way and give wishes for something new and fabulous to happen frequently. 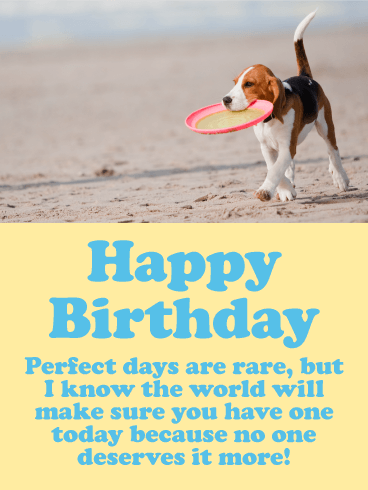 Birthdays are for having fun and this card will guarantee that your friend will have a great one. It's one thing to have a perfect day, it's another to share it with the perfect people. While you may not be there to celebrate a birthday, you can still be apart of it. Make them laugh and think of you with fondness. 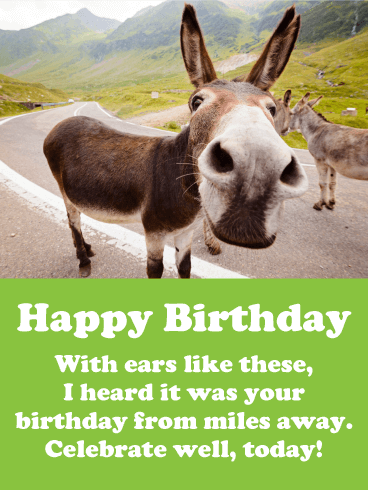 Share your feelings, despite the miles, with this pleasant birthday card that gifts perfection in every way. Sometimes a high five just isn't enough, especially when it's for a birthday. 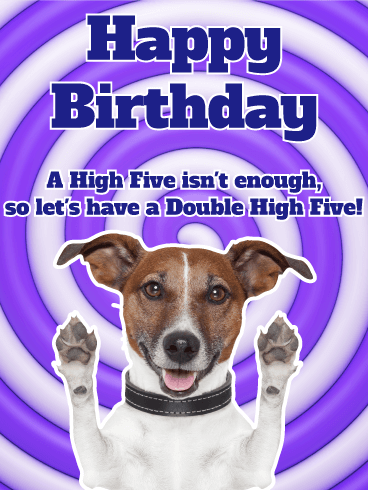 That's why we created this funny double high five Happy Birthday card! The puppy is just waiting to wish someone a Happy Birthday "double high five" style, so be sure to send him on his way. The unique purple and white pattern in the background only adds to the celebration and happiness! This panda is cute and so are you! 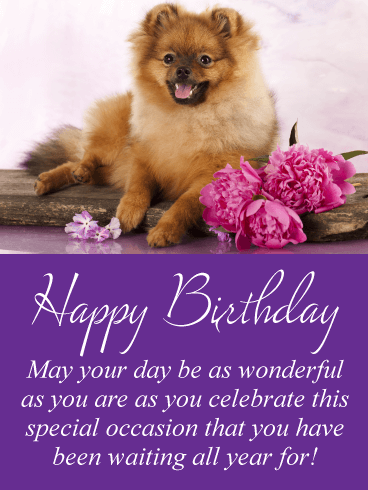 Wish someone sweet an adorable and relaxing birthday today. 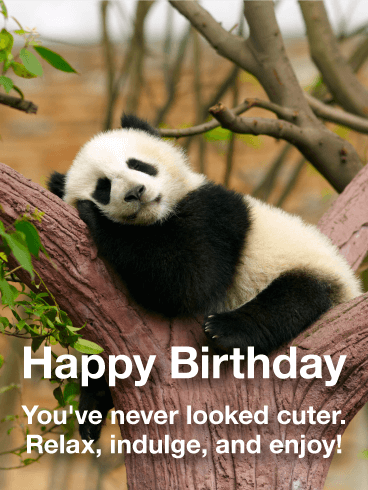 What is better than a panda bear birthday card? The answer is: nothing! Nothing beats a panda! 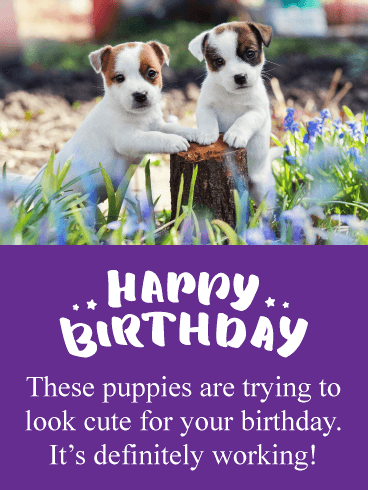 Make someone's day, and send them all the fluffy cuteness in one terrific birthday card! 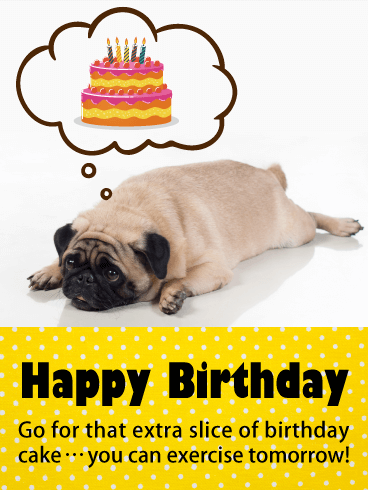 Remind your friend to relax, indulge, and enjoy their birthday-send this super fun and super cute birthday card.